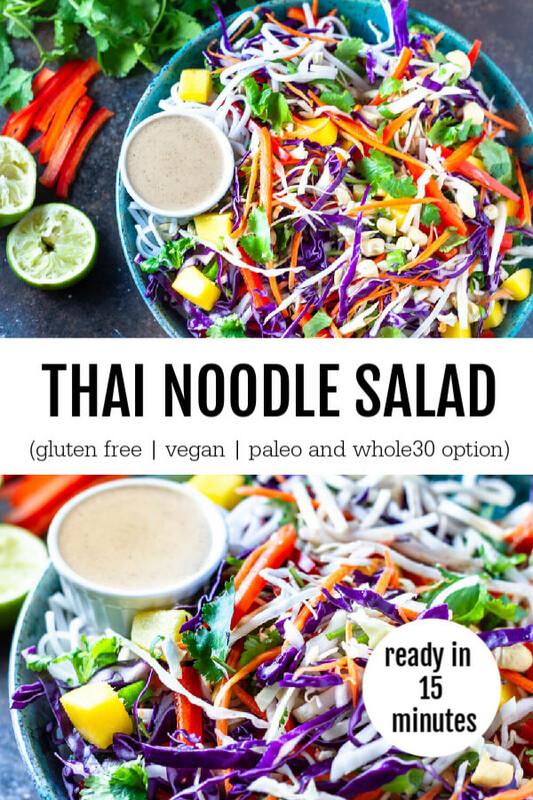 This fresh and flavorful Thai Noodle Salad is jam-packed with crunchy vegetables and drizzled in a creamy almond butter lime dressing. And comes together in about 15 minutes. I’m celebrating the change in season with a veggie-packed salad that I think you’re going to love. 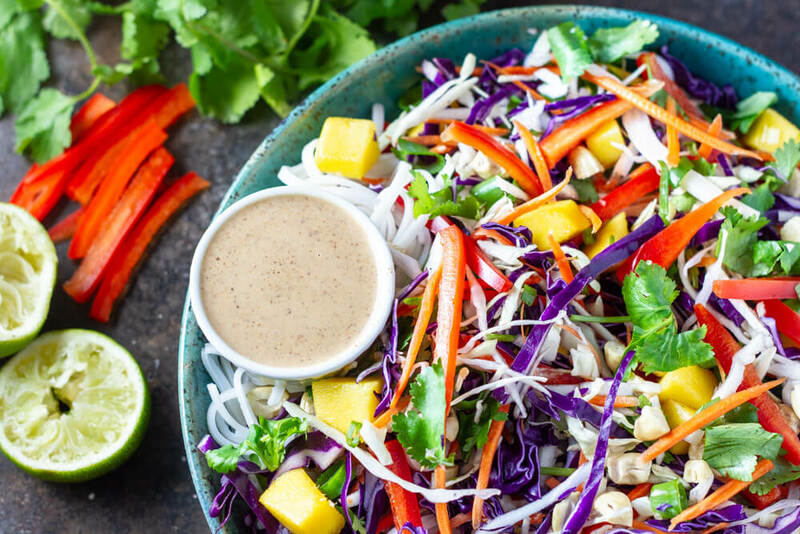 It’s colorful, vibrant, and full of all the fresh things. But mostly I think you’re going to love it because it’s so easy to throw together. Crunch. Crunch. Crunch. That’s me devouring the rest of this amazing salad that I’m about to share with you. I am beyond excited to be adding more fresh foods into my diet now that it’s Spring. I honestly don’t eat a ton of raw foods in the winter. 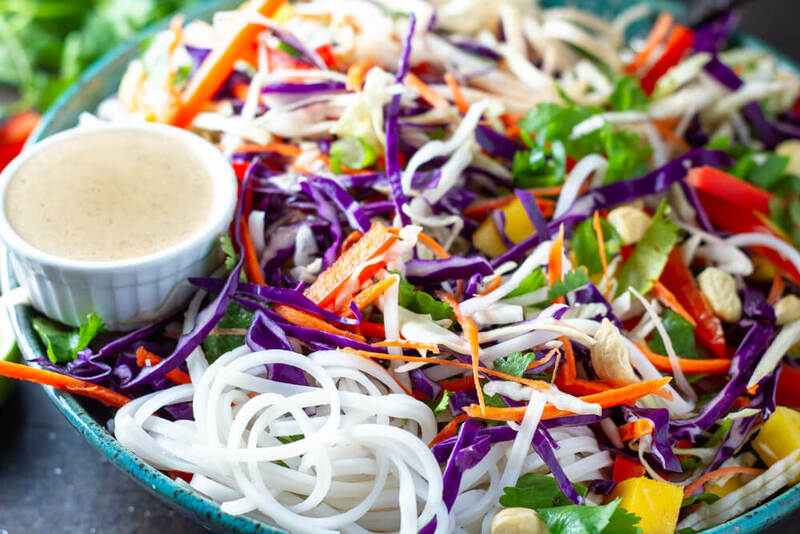 And what’s better than a salad with noodles and a tasty Thai dressing? … quick and easy. My main goal here on the blog is to create recipes that are easy for everyone to make at home. 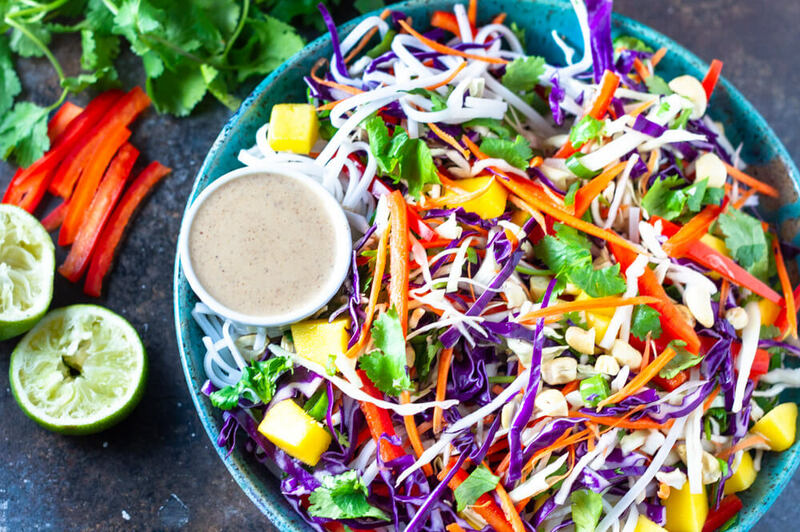 This salad literally can be made in about 15 minutes. … crunchy veggies. 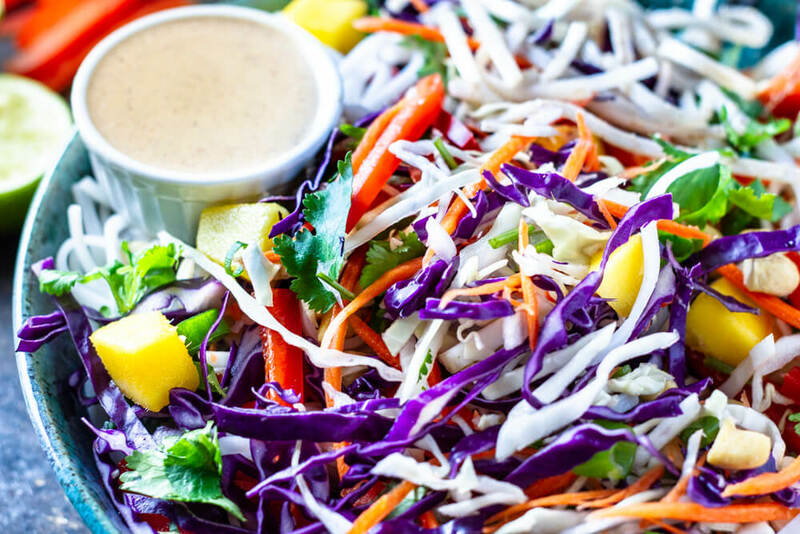 Shredded cabbage, julienned carrots, and sliced red peppers all together to give you the crunch that we all love and the nutrient-dense goodness that we all need. This salad is all about different textures. … noodles. Who doesn’t love noodles? 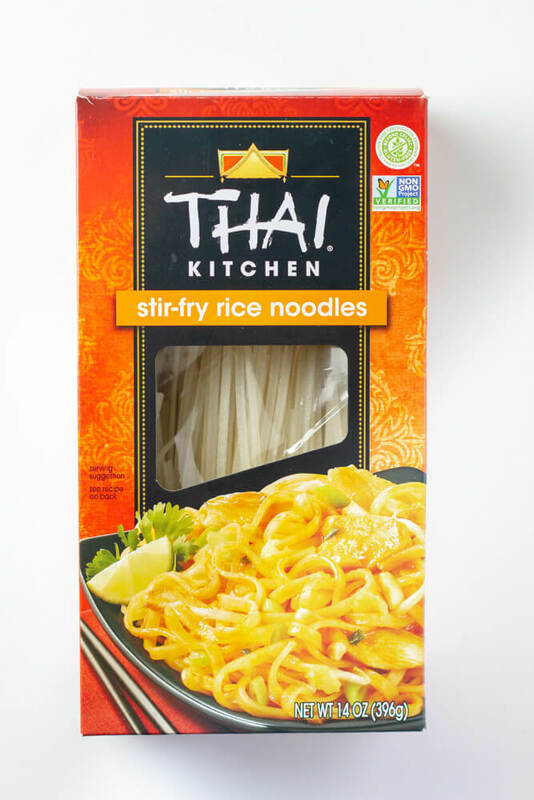 I use pad thai-style rice noodles because that’s what I like, but feel free to use any kind of noodles that you love. 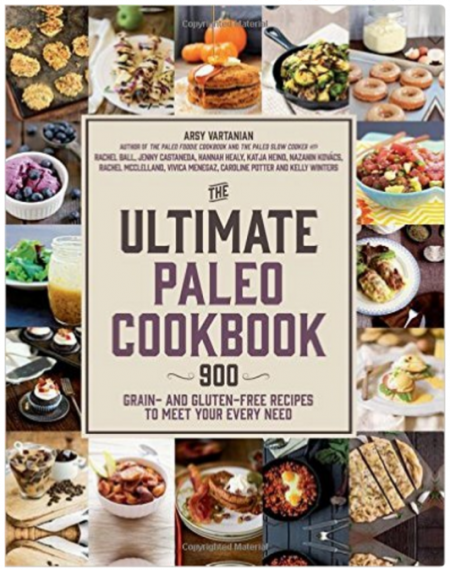 I’ve listed some paleo and whole30 options below. … the dressing. Almond butter, lime, sesame, ginger, and garlic. So creamy and delicious and similar to a traditional Thai peanut sauce. Feel free to use any nut or seed butter that you like. … cilantro. So much fresh cilantro really makes this salad POP. Cilantro not your thing? Feel free to sub basil. … mango. Sweet, ripe delicious mango makes me think of warm, tropical places. I think I need to go traveling. … meal prep. This salad can be made ahead of time and eaten throughout the week for easy lunches and snacks. It stays nice and crisp if you don’t add the dressing. Add a bit of your favorite protein for a more hearty meal. I’m thinking a couple of perfect 6 minute eggs…..Mmmmmm! … use whatever veggies make you happy. Some suggestions are diced cucumber, julienned jicama, and diced avocado. It all works. 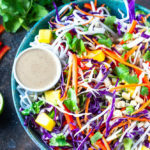 … for all you love carbers, sub the rice noodles out for zoodles (zucchini noodles) and omit the mango and sweetener in the dressing. … paleo people and whole30 folks: use zoodles, cooked and cooled sweet potato noodles, spaghetti squash noodles, or butternut squash noodles. Omit sweetener in dressing for whole30. See… I told you that you were going to LOVE this salad. these are the rice noodles that I use. If you try a recipe, please use the hashtag #savorylotus on INSTAGRAM for a chance to be featured. 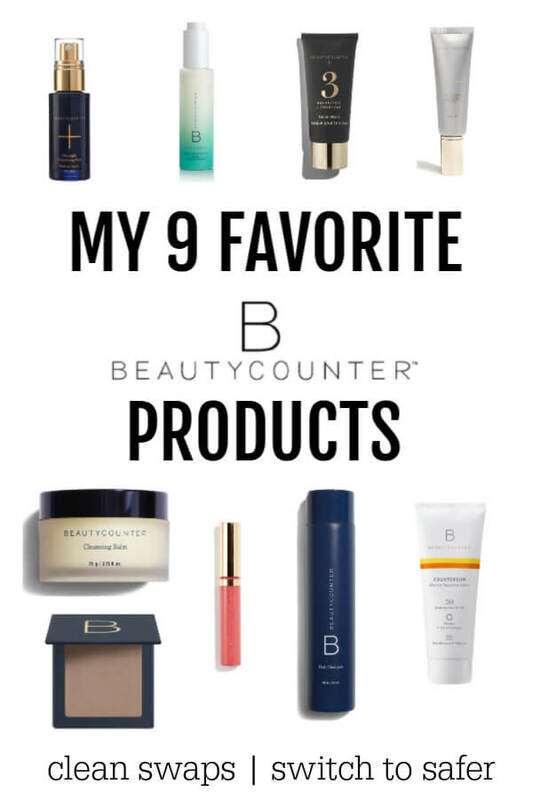 FOLLOW SAVORY LOTUS ON PINTEREST AND FACEBOOK TO KEEP UP WITH LATEST CONTENT AND UPDATES. Boil 4 cups of water in tea kettle or pot. Place rice noodles into a large glass bowl. Pour boiling water over noodles and allow to soften for about 10 minutes. Drain and rinse with cold water. Set aside. Meanwhile, place all dressing ingredients into blender and process until creamy smooth. Adjust for sweetness and extra coconut aminos, if desired. Thin with water, one tablespoon at a time, to get desired thickness. Set aside. Chop, grate, and slice cabbage, carrots, red pepper, mango, and cilantro. Place cooled rice noodles into large bowl and add veggie mixture. Mix to combine. Top with green onions and cashews. If serving entire salad, drizzle on dressing and toss until well coated. For individual servings, keep undressed until ready to serve. Store leftovers of undressed salad for up to 4 days in fridge.